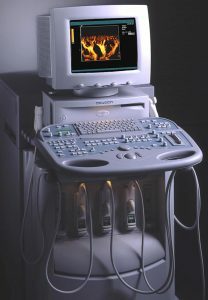 Buying a reconditioned ultrasound system makes a lot of sense in today’s economic climate. Associated Imaging Services can provide your facility with state of the art technology at an affordable price. AIS provides our customers with substantial savings by providing ultrasound systems that meet or exceed anything else offered in the market today. Before we install any piece of pre-owned equipment, it has been completely reconditioned and brought up to factory specifications. All AIS ultrasound systems are fully refurbished to look and perform like new. Every AIS refurbished ultrasound system is installed with a full one-year warranty, identical to the warranty that you receive when purchasing a new system. Our customers save thousands of dollars, receive the same warranty as new equipment, and have confidence in knowing that Associated Imaging Services is providing service on any warranty work. From complete systems to printers, DVDs, PACS options, and networking, AIS can provide your department with cutting-edge technology at an affordable price. We are firmly committed to customer satisfaction by meeting and exceeding your expectations.